What colour is best for me? LED Lights are available in a variety of colours. The reds, blues and yellows etc, are self explanatory but there are two white options that may be confusing. Pure white refers to a stark white colour similar to fluorescent tubes, while warm white refers to the colour normally found in household bulbs. In addition to LED lights cost saving benefits, LED lighting is ideally suited to a number of residential, commercial and industrial purposes. For instance, you can significantly reduce your home electricity bill by replacing all your room lights with LED bulbs and benefiting from lower LED lighting prices. LED lights are also imminently suited to outdoor lighting purposes, such as garden lights, security lights and swimming pool lighting. LED tubes can be used to light offices, classrooms, conference centres and warehouses. LED lights can even be used in street lights and replace traditional automotive lighting systems. For example, LED lights can be found in many modern headlights, tail lights and indicator lighting systems. The flashing lights of many emergency vehicles consist of LED light bulbs. Even trucks and boats make use of LED lighting systems these days. Don’t be left behind as LED lighting grows from a trend among the purely eco-conscious to widespread adoption internationally. 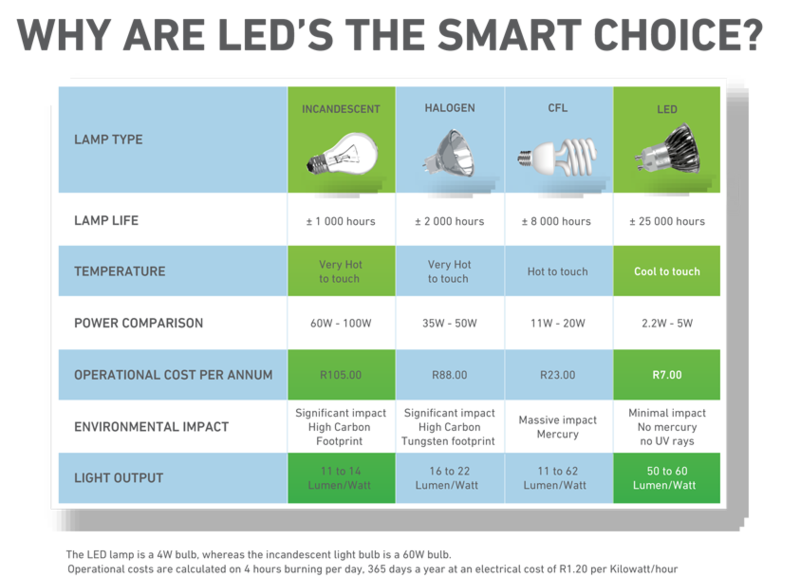 Visit savenergy.co.za for a selection of LED lights at the lowest price that meet your household needs; reduce your energy consumption, save money and join the growing crowd of environmentally aware.